Calcaneal apophysitis is a painful inflammation of the heel's growth plate. It typically affects children between the ages of 8 and 14 years old, because the growth plate of the heel bone is not fully developed until at least age 14. New bone is forming at the growth plate at the back of the heel which creates a weak spot at the area of the attachment of the achilles tendon. When there is too much repetitive stress on the growth plate, inflammation can develop. Overuse and stress on the heel bone through participation in sports is a major cause of calcaneal apophysitis. The heel's growth plate is sensitive to repeated running and pounding on hard surfaces, resulting in muscle strain and inflamed tissue. Those children and adolescents involved in soccer, track, or basketball are especially vulnerable. 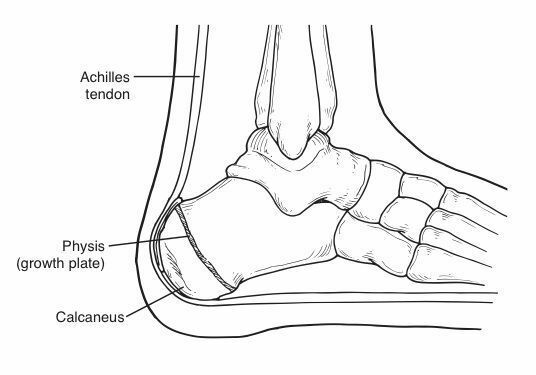 Other additional potential causes of calcaneal apophysitis include obesity, a tight Achilles tendon, and biomechanical problems such as flatfoot or a high-arched foot. Symptoms of calcaneal apophysitis may include may, include pain in the back or bottom of the heel, limping, walking on toes, difficulty running, jumping, or participating in usual activities or sports, pain when the sides of the heel are squeezed. To diagnose the cause of the child's heel pain and rule out other more serious conditions, the foot and ankle surgeon obtains a thorough medical history and asks questions about recent activities. Your podiatrist will also examine your child's foot and leg. X-rays are often used to evaluate the condition. Other advanced imaging studies and laboratory tests may also be ordered. Often heel pain in children returns after it has been treated because the heel bone is still growing. Recurrence of heel pain may be a sign of calcaneal apophysitis, or it may indicate a different problem. If your child has a repeat bout of heel pain, be sure to make an appointment with your podiatrist. Avoiding or limiting wearing of cleated athletic shoes.